One of my favorite destinations in south India is Hampi. The old city has a charm that keeps attracting you like a magnet. Hampi becomes particularly lively during the time of yearly festival Hampi Utsav. Hampi Utsav is a grand scale festival celebrating the beauty and legacy of Hampi. There are major dance and music festivals to look for. Ministry of Karnataka plans for a grandeur festival on 3rd, 4th and 5th of November 2016. 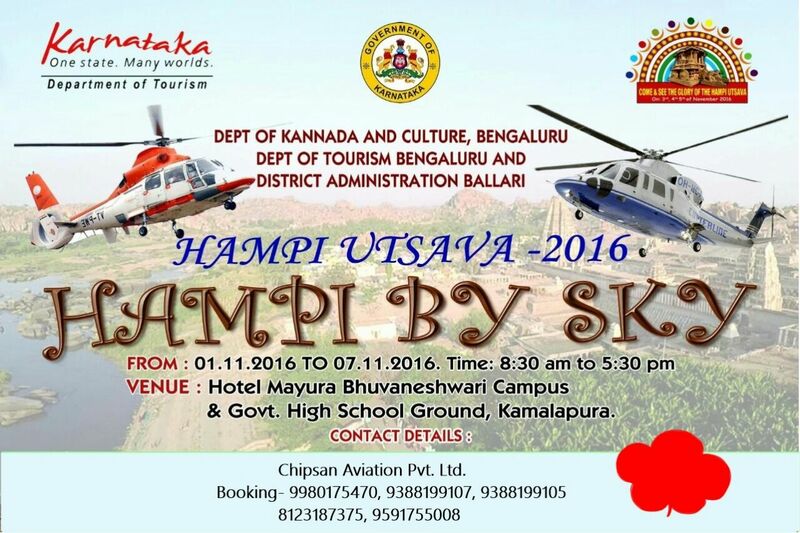 Hampi Utsav itself is a great event to look for, but his year it gets more grand with the sky tours. It is through a Whatsapp group that I came to know about the "Hampi By Sky" program conducted by Chipsan Aviation Pvt Ltd. For me it sounded like a great idea. It would be a great experience for all those who would explore the amazing landscape and temples of Hampi from the skies. As they say, the perspective gets better and better as you go up! I had a chat with the organizer from Chipsan Aviation Pvt Ltd. As I was excited about the idea of a sky tour, sharing it with all my readers. You can visit the Chipsan's website here: Chipsan Aviation Pvt Ltd . If you have time, I would suggest you go through their websites to know more about the other similar tours conducted by them. Disclaimer: This article is purely in the nature of information sharing. I am not an owner or connected with Chipsan Aviation Pvt Ltd or endorsing them. I have received the information through tourism Whatsapp group and later I have chatted with the representative of Chipsan Aviation. As I suggested, Kindly go through their website for more information about the background of the company and to know more about their fleet.